Interested in working for the Transportation Security Administration (TSA)? The TSA is responsible for keeping travelers and commerce in the United States safe from harm. They secure airports, seaports, railroads, highways, and/or public transit systems. The agency is under the U.S. Department of Homeland Security and was created in response to the September 11th terrorist attacks. TSA employees have many roles, from looking for suspicious behavior amongst passengers to overseeing the canines hunting down weapons, drugs, and illegal materials. 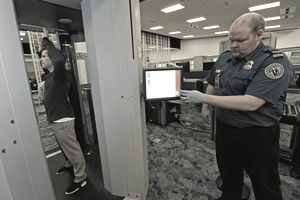 While TSA employees handle security for all major modes of transportation, perhaps one of the agency's biggest responsibilities is managing security at airports, where Transportation Security Administration agents screen passengers and their luggage for harmful items. Before you apply, you can learn about the TSA and decide which area interests you on the website. Details about the agency's mission as well a list of pay bands and more are also available online. If you are considering a job in the Transportation Security Administration, read on for more information about the kinds of jobs and careers available at the agency, as well as how to search and apply for TSA jobs. TSA applicants will apply on the USAJobs search page by keyword (Job title, department, agency, job series, or occupation) and location. After the search, applicants can filter results by Hiring Path, Pay, Department & Agency, Location, Work Schedule, Appointment Type, Security Clearance Level, Percentage Travel, and Job Series (a numbering system for grouping similar occupations). Those applying on a computer may use as many filters as they want through the filter feature on the right side. Candidates can remove a filter simply by click on it, found at the top of the webpage. To apply for their job of choice, candidates select the position of interest and click on the title of the position for further information on job requirements and the description, as well as instructions for completing an application. All applicants must create an account with USAJobs to apply. They can access and view application status updates on their personal Candidate Dashboard. The TSA employs full-time and part-time transportation security specialists and law enforcement. Management level positions are also available. Search online for Transportation Security Administration, Federal Air Marshal Service, and Airport Security job openings in the location where you want to work. For more information on requirements, benefits, and training, as well as the types of opportunities available, explore the TSA jobs site, which offers background information as well as directions on how and where to apply for positions. Jobs have different application instructions, so carefully follow instructions posted for each job. You may be able to apply online for some TSA positions. TSA is committed to ensuring the transition from military to civilian life is as seamless as possible. The company provides a hiring preference to eligible veterans and individuals can learn more about career opportunities at TSA through the Veteran Program Office. TSA jobs require US citizenship and successful completion of a full background investigation. Persons interested in security officer positions must pass a medical examination, be able to read, speak, and write English, and pass a physical ability test, a drug and alcohol screening, and an aptitude test. Eligible candidates must also be18 years or older and have a high school diploma, GED, or security experience equivalent. The TSA holds job fairs called “Fast Track to Hiring” events throughout the year at various airports to speed up the hiring process for eligible candidates. These events feature multiple hiring components in one day. Applicants will normally attend an Information Forum to learn more about the position and employment with TSA, applying for a position, completing a Computer Based Test that evaluates English language proficiency and x-ray interpretation aptitude, and participating in a structured interview. TSA employee benefits include health, dental, life insurance, vacations, a 401(k) savings plan, transportation subsidies, and more. Employees also receive Disney extras, including theme park admissions and discounts on Disney merchandise. The company also encourages learning and development through educational reimbursement and learning and development opportunities. These opportunities include professional development training, computer skills, and business immersion programs.